Can I apply to TypeParis without any experience in typeface design? (In short: yes!) We are in the application period, and you are wondering what conditions must be met, beyond the official description proposed on the home page? You can see that the attendees final typefaces designed at the end of the five weeks, are of such a high level that it seems impossible to achieve the same level. Or that you already need a lot of skills before you can get to TypeParis. In fact, the participants come from a wide variety of backgrounds, with or without experience in typeface design, whatever your level, you will learn a lot. And the people who talk about it best are still the alumni. So we asked them some questions. We published the result of discussions with three TypeParis17 attendees, Tomson Chan, Sean Dougherty and Samar Zureik who share their throught about their experience, past and future. TypeParis19 is the fifth edition of the type design program launched in 2015. Feel free to contact them directly via their People page, to ask about some specific details about their 5 weeks in Paris. Why did you decide to apply to TypeParis? Tomson Chan: I have been working in book design and branding design for a couple of years. Typography has been always my biggest interest and the key in my design and life, I have been self-learning by reading and practicing for awhile. I was looking for a professional training for type design, then Roland Stieger introduced me Typeparis at that time when I was doing another book design workshop in Beijing. I did compare it with another one but I was more interested in Paris at that moment as a Hong Konger. Sean Dougherty: Though I cannot recall exactly which one, I learned about TypeParis via a design blog. I was at a point in my career when I had not worked with custom typefaces nor custom typography in too long of a time period. Even when I had, I’d used existing typefaces only (manipulating, modifying). I’d worked with a lot of designers who had attended Cal Arts (under Jeff Keedy and Michael Worthington) and I always admired their comfort with form-making when it came to working with type. I had some formal type design experience but these were only single, three-hour weekly course (x14 weeks) at Art Center College, most of my type education was via typography courses, not type design courses. I was looking for an immersive program of any duration up to 3 months and so when I discovered TypeParis, it aligned with what I was looking for, namely to work hands-on with type related forms. 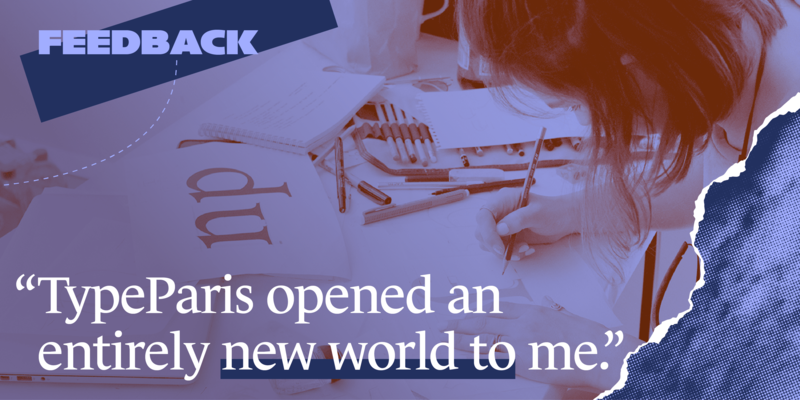 Samar Zureik: I first heard about Typeparis from Nisrine Sarkis, one of the program’s Alumni. I follow her on instagram where she posted about Typeparis, and I got curious. At the time of my application I had a growing interest in type design, but it was a complete mystery to me, and I had no idea where to start. After researching the program further, it became clear that TypeParis is a great place for me to start and test my interest. From left to right: Tomson Chan, Samar Zureik. TC: I was a little bit worried, though my work was typography driven, they were more in Chinese. It was a happy day when I received the confirmation letter. SD: Building a portfolio was not difficult, as I felt that I had work that was relevant to the WHY I wanted to apply. I felt that I had enough work that suggested that I had familiarity with typography and an ability to draw, a facility for software/tools and a genuine interest in design/type. I had wondered if my application would align with the type of students that the program was looking for. I noticed, from the previous year Instagram posts, that most students were younger and perhaps there might be a reason for this. That was the only concern that I had ahead of applying. SZ: My experience up to that point was mainly as an illustrator, so building the right portfolio for TypeParis was a bit tricky for me. I had been practicing Arabic calligraphy, but at the time of my application in 2017, I was still at the early stages of my practice. And so, my portfolio was mostly illustrations with a few examples of branding projects. Because of this, I was worried that my illustration experience will not be seen as enough to grant me acceptance. So when I received the email of acceptance it was a big and pleasant surprise! Tomson Chan’s work from TypeParis17. TC: The 5 weeks program was much more intense that I imagined, you have not much time to visit Paris but crafting your type even in weekends! So better spend some more time to stay afterward with your friends to explore the city habits! SZ: Just apply, if you have an interest in typefaces and letters this is the right place to be. It will either launch you on a path to pursue type design further, or allow you to integrate these design skills with your current practice and skill set. TC: I came to typeparis without professional type-design training background, but I found some of the classmates were the same, and they are all super nice and talented people from all over the world! With the great tutors like Julien, Mathieu and Jean François, they are very patient and explaining in details. The schedule and learning targets in first 2 weeks were very well constructed, we started from learning calligraphy by hand first then to find out the shape of the letters by using tracing papers. I like the process very much, that helped me to understand the structure and rules of designing letters. It become my practice now, using tracing paper to sketch before I go into computer. That’s something I can get easily by self-learning. SD: What I’ve noticed most about my design after attending TypeParis relates most to my process. Over the years, timelines have shrunken and so the need to produce and export with such short turnaround times caused me to adopt some sloppy habits. Now, I try to be much more methodical and systematic. Specifically I look more diligently at the relationship between individual elements and the families that they belong to. I aim for consistency with much more effort than I had previously. SZ: TypeParis opened an entirely new world to me, and through the program, I realised just how much I enjoy working on letterforms. Before the program, I found typeface design difficult to understand, especially in terms of a practical approach, e.g. what tools, both technological and manual are being used? During TypeParis, we explored every feature of letterforms; weight, proportions and contrast. TypeParis was an encouraging place to start, I was able to test and then act on my passion for type design, gain confidence in my abilities, and understand the underlying technicalities. TC: After TypeParis17 I came back to Hong Kong as Lead designer in my agency. I made some good friends from different countries at TypeParis, to me that’s the best part of the program. I am still staying closely in touch with some classmates and tutors, last time I met one of my classmate when he came to Hong Kong, it was fun. Also the TypeParis experience boosted me to work in Europe in the coming year after I was granted a design award from Hong Kong recently. SD: A few months after TypeParis I was fortunate enough to contract with an internal design team at Google in San Francisco to work on a large-scale brand experience where I was in charge of developing media (screen) content – some of which was purely image-based while some was typographic in nature. After this, I contracted with Facebook’s hardware division to design a physical event/experience for a product. For the last 4 months I again worked within Google to help define a content strategy for an upcoming initiative (currently confidential). Most recently, I’ve accepted a full-time role as a brand lead at Hulu here in Los Angeles. For those outside of the USA, Hulu is a content platform that is currently in the USA and China (similar to Netflix). In this role, I’ll be responsible for how the brand shows up in the world – its visual tone, how the brand translates into various media and executions as well as evolving the voice of the brand. I do keep in touch with members of my class. I notice that I tend to keep in touch with ones that are active on Instagram as Tomson, Adriana. Elisabeth Bolzon actually visited Los Angeles and stayed with us in our home last year. SZ: Towards the end of the program, I felt that five weeks were not enough. I was still immersed in thoughts and ideas about type: both practical and theoretical. So I decided to apply to a longer type design program at ESAD in Amiens and this where I am now. I am focusing on typeface design while still maintaining a close connection to illustration skills. I am also still in touch with few of my classmates, and we share our news with each other every once in a while. Apply before the 14 March 2019! Just follow the application process as explained on the program page. The deadline for applications this year is the 14 March 2019. Thanks to Adobe and Adobe Fonts to be our platinum sponsors since 2015. Interested in sponsoring? Download the Sponsor pack.